Situated on a quiet country backroad, this is the Volunteer’s Arch at Lawrencetown, County Galway. 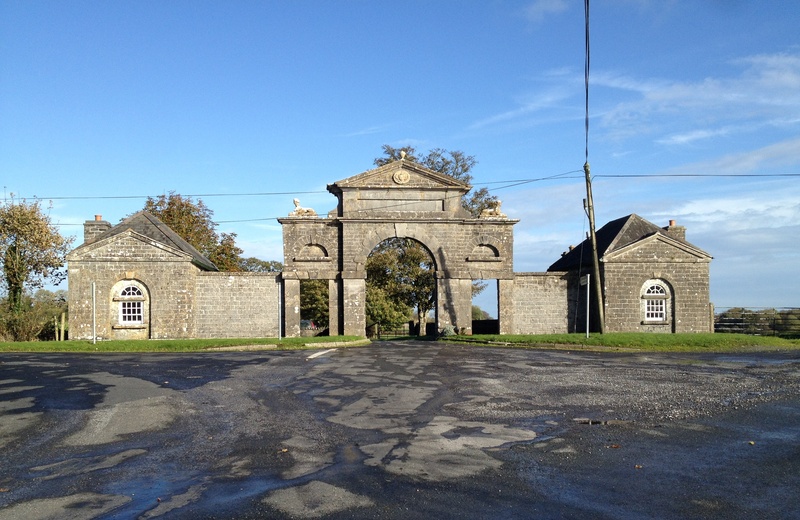 The monumental gateway was built in 1782 as the principal entrance to an estate called Bellevue owned by Colonel Walter Lawrence, an ardent supporter of the Volunteer movement and of Henry Grattan’s efforts to achieve legislative independence for the Irish parliament. Following the achievement of the latter, Lawrence erected the arch which consists of a main entrance flanked by smaller openings which in turn are connected to two-room lodges. The entrance is surmounted by a pediment topped with an urn and with a carved medallion beneath, while sphinxes rest on either side. A recessed panel directly beneath the pediment bears a Latin inscription which translated reads ‘Liberty after a long servitude was won on the 16th April 1782 by the armed sons of Hibernia, who with heroic fortitude, regained their Ancient Laws and established their Ancient Independence.’ Bellevue is long gone and the gateway, together with a couple of follies, is all that remains of Colonel Lawarence’s efforts. The lodges have recently been restored and perhaps in the coming months might find a use or occupant. And the local authority might like to straighten, or better yet remove, the telegraph pole that mars the appearance of this delightful structure. The Irish Aesthete takes this opportunity to thank all readers for their invaluable support and interest during the past twelve months, and to wish them a very Happy New Year. There will be lots more of Ireland’s architectural heritage to explore and share in 2014.